Welcome to Spine! This user guide will teach you how skeletal animation in Spine works, how to set up and animate your skeletons, and how to use all the features that Spine has to offer. If you are evaluating Spine before purchasing, you can download the Spine Trial which allows you to try out all of Spine features, though you won't be able to save or export your project. If you have purchased Spine, follow the link in the license email you received once your purchase was complete. If you cannot find your license email, first try to find it in your spam or junk email folder. If it still can't be found, please contact us. The first time Spine starts, an internet connection is required so Spine can download the latest update (a proxy server can be specified). After that, an internet connection is only required to check for and download new updates, which Spine will download and install automatically. See Updates for more information. The changes in each update can be seen in the changelog. The spineboy example project will open by default. Spine comes with many other example projects which can be found in the Spine installation folder under the examples subfolder. 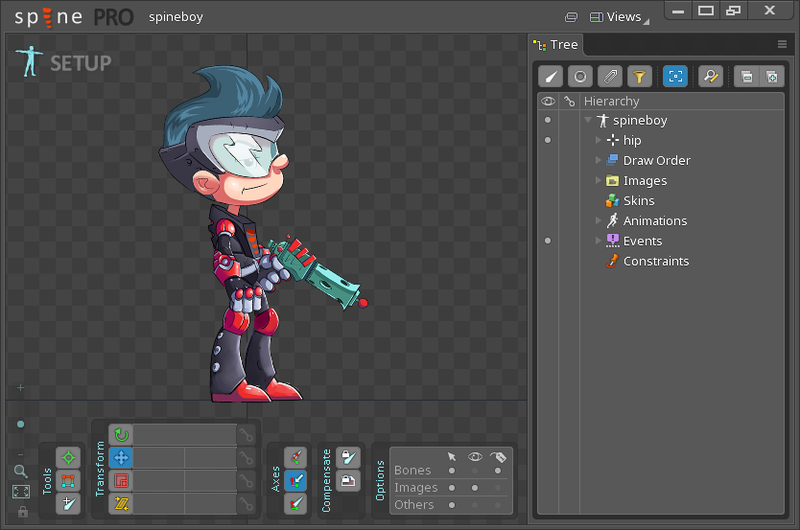 By default, Spine has the editor area on the left and the tree view on the right. This can be customized by dragging the edge of the tree view to resize or dragging the tree tab to move it. See Views for more information. The Spine menu is accessed by clicking the Spine logo in the upper left. Panning in the editor area is accomplished by moving the mouse while holding the right mouse button. If using an input device without right button, the Pan hotkey can be set. While this hotkey is held, moving the mouse while holding the left mouse button will pan. Zooming is very important in Spine. To zoom in, place the mouse on what you'd like to see larger and scroll the mouse wheel upward. To zoom out, place the mouse near the edge of the screen where you want to see more and scroll the mouse wheel downward. Zooming with the mouse wheel will soon become second nature, allowing you to quickly zoom to exactly where you like. It is so convenient that zooming can often replace panning by zooming out, then zooming in to a new location. If your mouse does not have a mouse wheel, you can alternatively hold ctrl (cmd on Mac) and the right mouse button, then drag up or down to zoom out or in at the mouse location. The zoom level is indicated by a vertical slider in the lower left corner of the editor area. The slider can be dragged, but this is much less convenient than scrolling. Below the slider are two zoom buttons. The magnifying glass button zooms to 100%, so images appear at their actual size. The box button adjusts the zoom level so the skeleton fills the editor area. 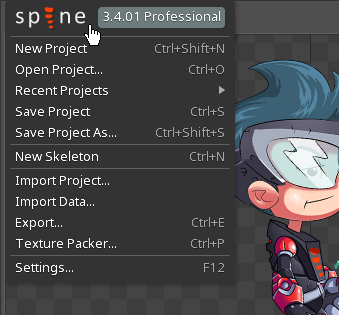 Nearly any action in Spine can be undone by pressing ctrl+Z (cmd+Z on Mac). Redo is done by pressing ctrl+shift+Z or ctrl+Y (cmd+shift+Z or cmd+Y on Mac). If not using a QWERTY keyboard, the default hotkey may use a different key. For example, Y instead of Z for a QWERTZ keyboard. All hotkeys can be customized. Switch between setup mode and animate mode by clicking the icon in the upper left of the editor area. Setup mode is used to create and configure skeletons. Animate mode is used to design animations. This is explained in depth later in this guide, for now you can switch to animate mode and click play in the dopesheet view to see spineboy animate.